I recently discovered Kraft-Tex - a paper product that behaves like fabric and looks and wears like leather. It's pretty awesome. For my first project, I thought I would start simple and make myself a small traveler's notebook. I purchased a passport-sized Midori notebook a while ago and I like it, but the cover is a bit stiff and the size just a bit too small. There are tons of 3.5x5in pocket notebooks out there that just don't quite fit it. 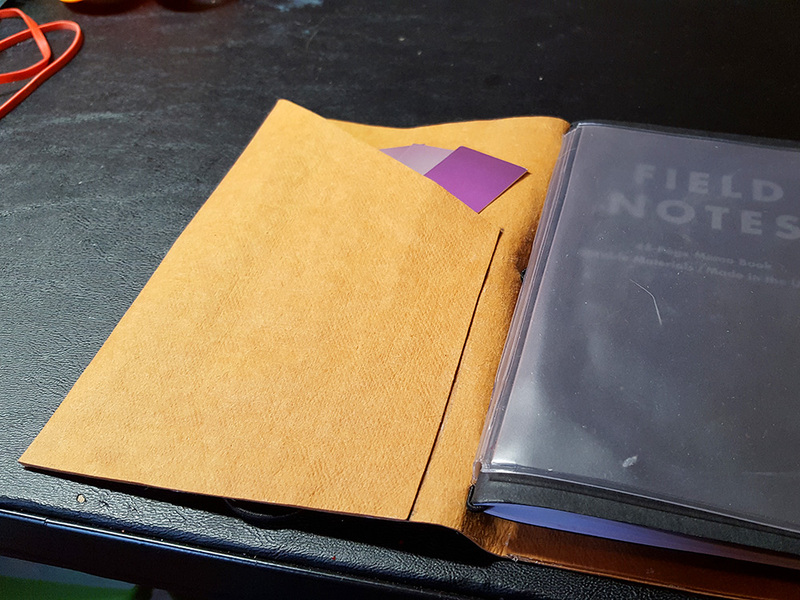 So with that in mind, I wanted to make a cover that would fit the Field Notes notebooks I have laying around. First impressions when opening the roll of Kraft-Tex where that it felt like a very stiff paper or thin cardboard more than it did leather or fabric. So I decided to test the claim that it's waterproof and durable by soaking my piece in some coffee for a bit. It picked up a bit of the darker color. If I'd been more patient and let it soak longer, I'm sure it would have absorbed more. After taking it out of the liquid, I waded it up a few times and worked it with my hands for a while. Then I hung it up by a fan to dry. Once dry, I did a bit of folding, cutting, and gluing and whipped up a notebook cover. I added inside pockets to it, so that most of the cover is double-chickness. Otherwise, the Kraft-Tex is just a bit thin (but totally usable if you don't want to double up). Here it is open, showing one of the inside pockets. 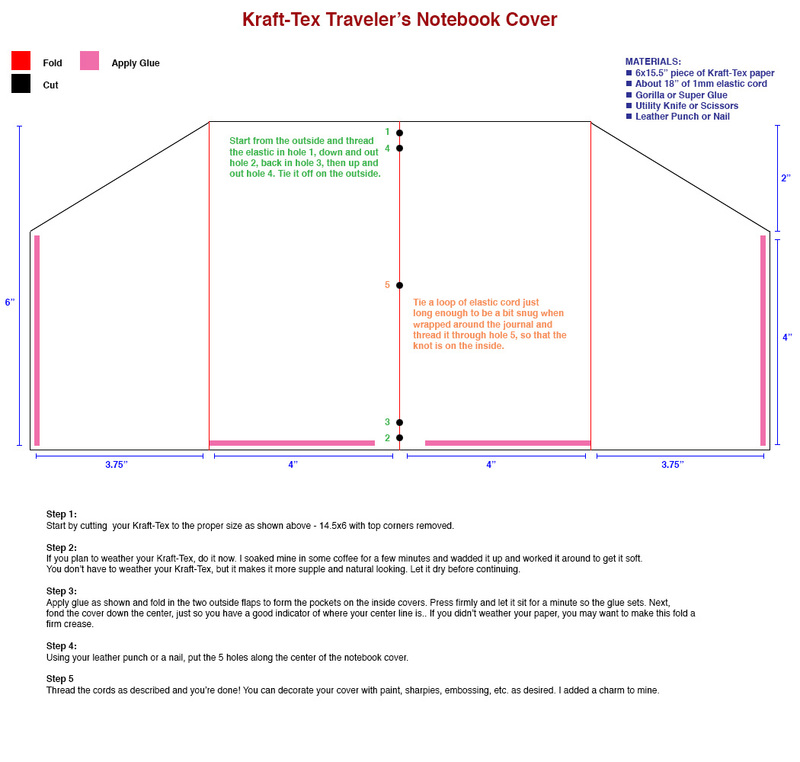 I went ahead and put together a quick instruction sheet explaining how I made the notebook cover. Once done, simply thread your notebooks through the strings inside the cover to attach them. You can also use rubber bands to add additional books. If this totally confuses you, check out Bryan Goulet's video on how these things go together. Is it as nice as the Midori? Honestly, no. 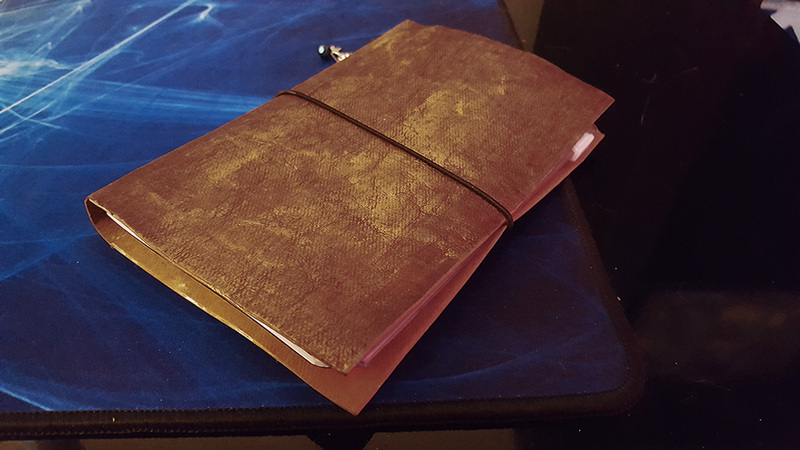 It's thinner, and while the paper is "leather-like" it's clearly not real leather (but I didn't have to kill a cow to make it, either), and the professionally made notebook is finished more nicely than my quick fold and glue job. But I like this notebook a lot. It's a much more convenient size. It feels rugged and looks weathered. It was fun and easy to make, and it's satisfying using my notebook that I made..... Plus, it semms like coffee. My verdict on Kraft-Tex itself is that it's a fun material that's easy to work with. I'm sure I'll put the rest of the roll to good use (and I will probably post those creations here). Update: I decided to do a little more work on the cover. 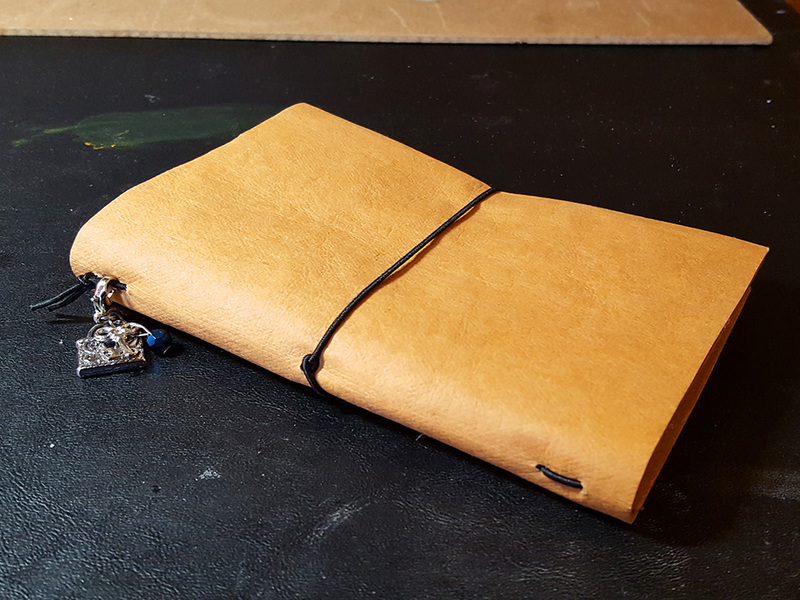 I pulled out some brown ink and some gold Rub 'n Buff and turned my somewhat plain cover into an old, weathered one that looks like it could easily pass for a wizard's spell book. It's hard to see in the photo, but the gold gives everything a nice sheen. I can't wait for this t hing to get beat up some more.